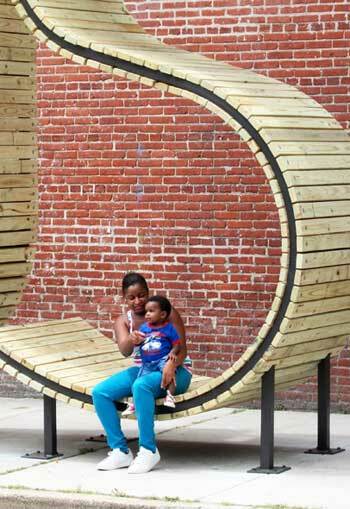 Landscape architects, architects, and artists are having fun with words in bus stops, playgrounds, and plazas. In these instances, letters become tangible and structural, so they can be touched, sat on, climbed on. The meaning of the words is clear or ambiguous. And, in one case, the letters can even be viewed from different angles to form new words. 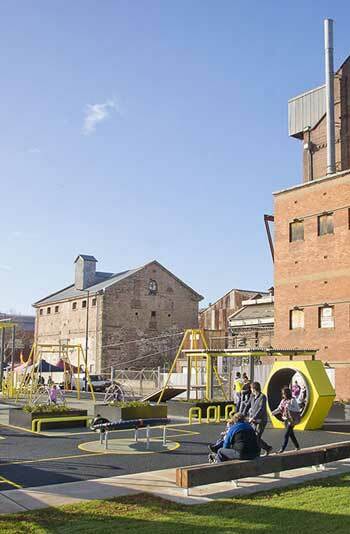 In three different public spaces around the world, word forms draw people in and enable new ways to communicate with the public. Given their tactile nature, they also invite conversation and interaction. 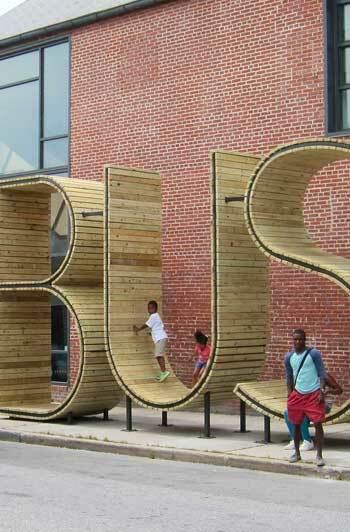 In Baltimore, a group of local and European Union arts organizations got together and financed a novel work by artists at mmmm spelling the word “bus” at, of course, a bus stop on S. East Avenue in Highlandtown. 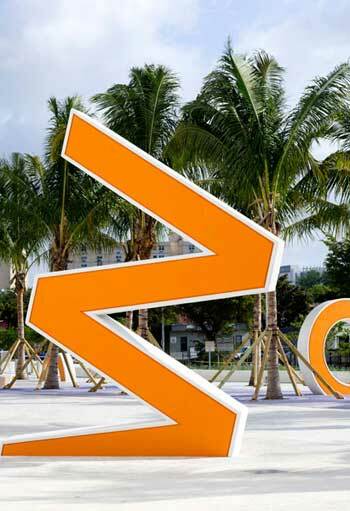 Each letter, which is made of wood and steel and is about 14 feet tall and 7 feet wide, can accommodate up to four sitters and even climbers. 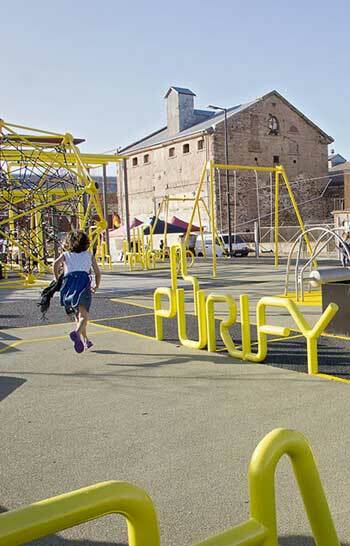 Words like “purify,” “flour,” and “ever” somehow relate to the wharf’s past commercial activities, but their meaning is not quite clear to us. For kids, these word forms are scattered about as pieces to sound out and read or further explore. 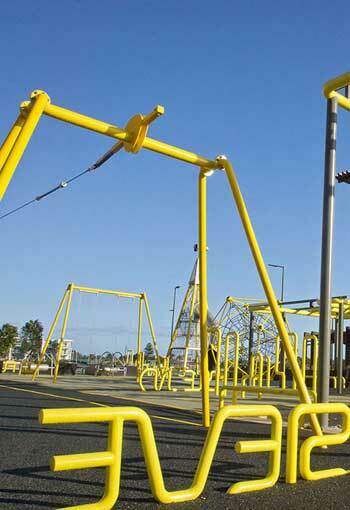 They are made of the same coated metal as the benches and playground equipment. And, lastly, architects with Snarkitecture, who may now be famous in design world for their indoor “beach” installation at the National Building Museum in Washington, D.C. this summer, which has already been visited by more than 100,000 people, created a public art installation in the plaza just to the east of the Marlins Ballpark in Miami. 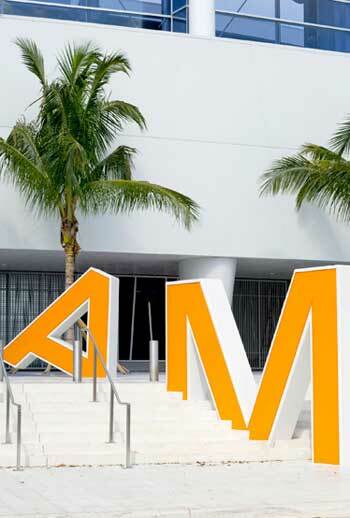 The giant letters, scattered throughout the plaza, hark back to the enormous “Miami Orange Bowl” sign of the stadium that stood on the site from 1937 until it was demolished in 2008. 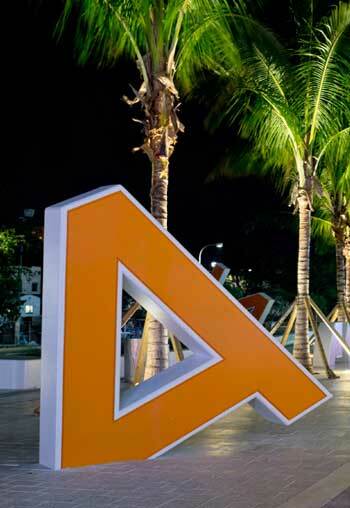 The exact same letters are reconstructed in the new plaza at the original ten-foot height, explains Snarkitecture. They can be touched, leaned against, and sat on. Previous Article How Can We Get Trees to the Communities That Need Them the Most?